What are those people doing in that brick building in Massachusetts? 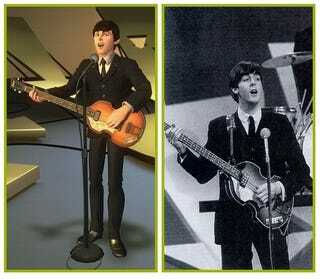 They're ensuring that the virtual Beatles look like the real Beatles. Bitmob.com has taken a gander at some images from the upcoming Beatles Rock Band game. They've taken a look at photos and video stills of the Beatles. And they've compared. The results aren't surprising. John looks like John. Paul looks like Paul. Etc. But they're still fun to look at. Not a zombie-eyed blank stare among them.